Keuchel openly suggested after the Astros' 7-1 loss to Seattle on Tuesday that he must have been tipping his pitches or opponents might have figured out the signs of catcher Max Stassi. But after studying video of the game, Keuchel (3-8, 4.13 ERA) said he could not identify anything that hitters were picking up. "Wrong pitch, wrong time," Keuchel said after watching the video of the loss to the Mariners. "I didn't see anything out of the ordinary." 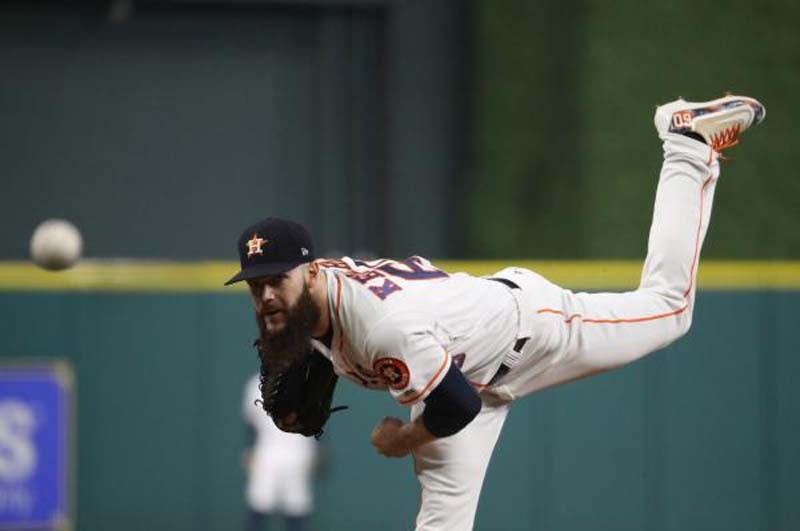 Keuchel will at least have that notion out of his mind when he goes to work for the Astros against Texas on Sunday afternoon at Globe Life Park in Arlington, Texas, in the finale of a four-game series between the Lone Star State rivals. The Rangers will counter with left-hander Matt Moore (1-5, 7.47). Moore will try to keep Texas from being swept in the series after the Astros defeated Texas 4-3 on Saturday. Texas left a season-high 16 runners on base in the loss despite having only five hits. Keuchel allowed six runs over the first two innings against Seattle before settling down to toss 6 2/3 frames. He's surrendered more runs (13) and a higher batting average (.357) in the first inning this season than in any other inning, and has given up the second-most first-inning hits (20) of any pitcher in baseball. "Anytime someone feels like they're throwing quality pitches and they're getting hit, there's an element of curiosity whether you're tipping pitches in a variety of ways," Astros manager A.J. Hunch said. "Whether it's through signs, through your glove, through your pace or tempo of your delivery. I don't know if there's anything specifically with Dallas." The Rangers have an offensive weapon with which to attack Keuchel with designated hitter Shin-Soo Choo, who extended his on-base streak to 25 games Saturday by drawing his 39th walk of the season in the fifth inning against the Astros. He later added another walk in the seventh. Choo's streak of reaching safely in 25 games is the longest active streak in the Major Leagues and is tied for the third-longest in the American League in 2018. "He's not missing pitches in his zone," Rangers manager Jeff Banister told mlb.com about Choo before Saturday's game. "He shrinks the strike zone for himself, doesn't chase. Prior to this streak he's on right now, the on-base streak, he probably expanded a little more than what he wanted to." Keuchel has to be better than his teammate, right-hander Charlie Morton, was Saturday. Morton walked six batters and hit four in 3 2/3 innings while allowing two runs and one base hit. He is the first pitcher since the Washington Senators' Long Tom Hughes to walk at least four batters, hit four more and strike out at least five in a game. Hughes accomplished the feat in a complete-game victory over the Yankees on April 18, 1913, more than 105 years ago. Keuchel is 9-9 with a 3.86 ERA in 24 games in his career against the Rangers and is 1-1 with a 2.08 ERA in two starts versus Texas this season. Moore has no record and a 5.56 ERA in two starts since returning from the disabled list on May 30. He will be working on regular four-days' rest after a no-decision in the Rangers' 7-4 road victory against the Athletics on Tuesday. Moore is 0-2 with a 9.00 ERA in two starts versus the Astros this season. He is 3-2 with a 3.46 ERA in five games against Houston in his career.